Dimensional Granite Have You Boxed Into A Corner? – Surestrike International, Inc.
Dimensional Granite Have You Boxed Into A Corner? For your toughest Dimensional Granite applications turn to Surestrike International’s complete line of impact hammers. Reliable quality from a trusted and proven manufacturer for over two decades. 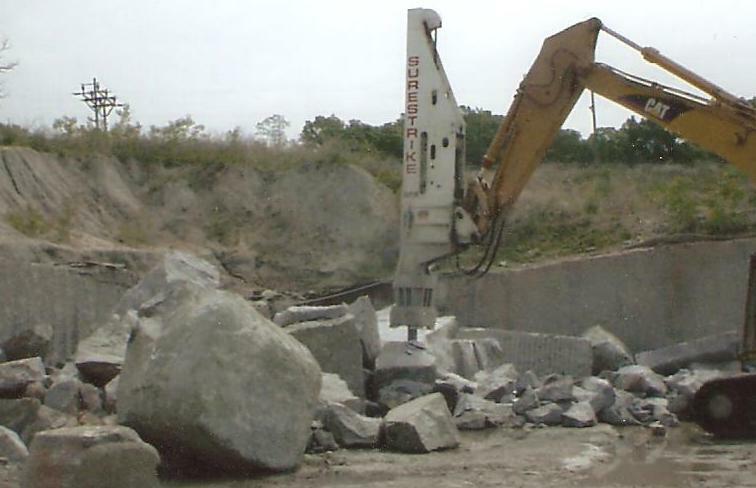 When a US contractor struggled with how to effectively handle the excess bi-product in their dimensional Granite stone quarry they turned to Surestrike for a proven solution. The challenge was with the waste rock that was either off color, wrong size, bad grain structure, etc. and is unusable for their main product which is dimensional cut stone (I.e. Countertops, monument stones, etc.). This bi-product had been stockpiled for many years because there had been no cost effective or efficient method to break it until the Surestrike hammer came along. The Granite bi-product had a high compressive strength (upward of 50,000 PSI) which made it very tough to break and the size, hardness and homogenous nature of the rock only added to the difficulty in breaking the material. Because this was a cut rock rather than a shot rock only compounded the problems and ineffectiveness of previous breaking methods. The size of the pieces needing to be broken down averaged 4’ x 6’ x 10’ with many of the pieces being 6’ x 8’ x 10’ and larger. Prior to the Surestrike impact hammer being put into service this customer attempted to solve their bi-product breaking needs with drop balls and hydraulic hammers. The drop balls used were slow, inefficient and the production was subsequently too low to be profitable for the quarry to continue with this method. Most of hydraulic hammers would not break the rock and when they did bring one in that could handle this tough material they found that either the production was too low or maintenance costs were too high. Using the Surestrike impact hammer the contractor was able break the oversize into 24” – 30” minus at a rate of approximately 100 TPH which was then fed into their crushing plant. This not only solved the space issues from years of stockpiling but also led to a profitable solution to a long standing challenge. For additional information on breaking your dimensional over please contact Surestrike International or stay tuned for future emails. Additional information can also be found at www.surestrikeinternational.com.